Bear Kaufmann, Jeff Tiedeken and Jim Mason are at University of Minnesota, Morris this week installing the Powertainer and setting it up for its initial runs onsite. 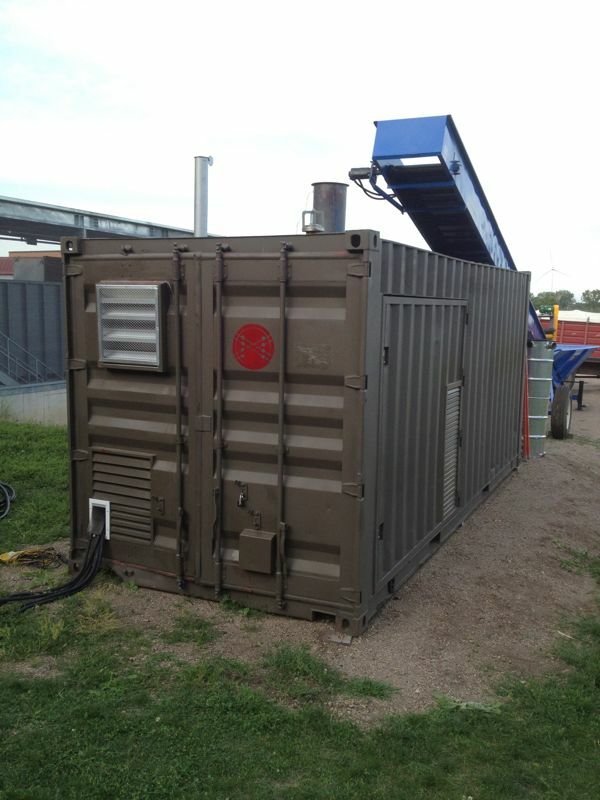 This has been a long haul, and we’re very happy to finally have it here and soon begin pumping biomass power back into the grid. 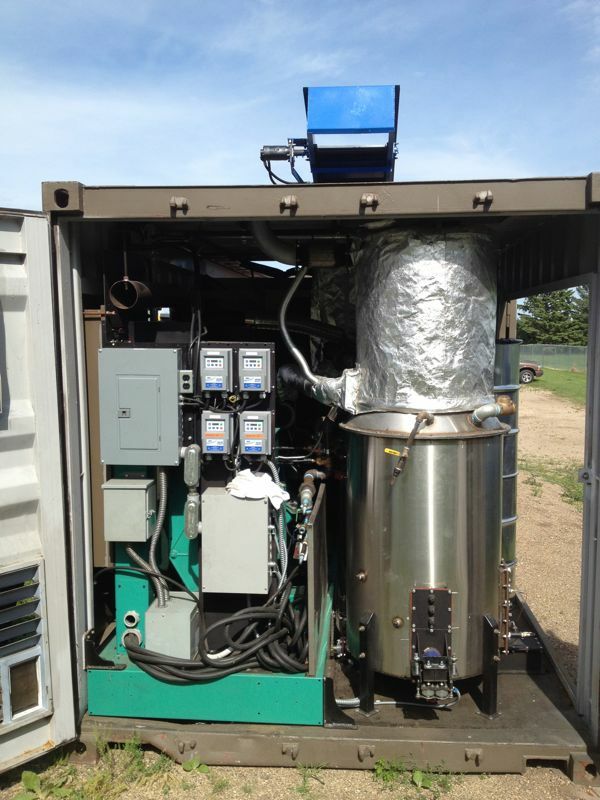 A big thank you goes to Lowell Rasmussen, Jim Barbour and Dave Aronson at the UMM for making this project possible, as well as their general dedication to proving small scale biomass energy for midwestern ag applications. As well a huge thank you to APL team member Nick Monahan for taking on the complexity of managing the overall construction project and CAD sheet metal origami that rendered it to real. For the next 6 months we’ll be learning and refining the installation onsite, and hopefully ending with a daily running installation. There are many details to work out, and surely many things yet to learn. 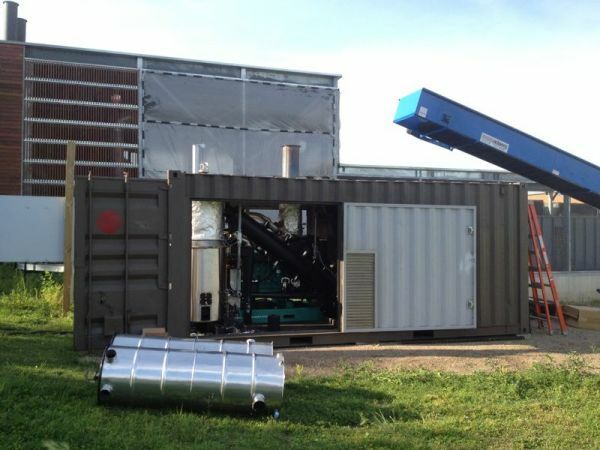 However, we are very satisfied with the fundamentals, and the general proving that one can compact and integrate the full gasification system (gasifier, filtration, engine and hopper) within one 20′ shipping container. The goal is the total system in a box, drop it off the truck and go. No onsite construction. Fill the hopper with a conveyor, skid steer or bucket tractor. 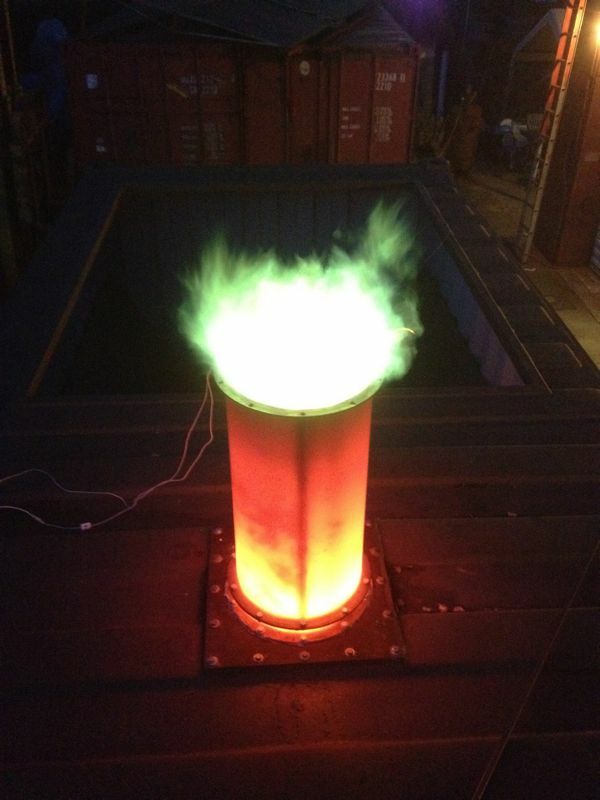 The architecture for this system is essentially the TOTTI vessel and heat exchange relationships scaled up, with an additional stage of using the engine radiator blast for predrying the fuel. The hopper is open to atmosphere, with a louvered base, so we can pass the hot radiator blast through the bed. This should significantly extend the fuel moisture range beyond the 30% or so top we can tolerate in the standard TOTTI on the Power Pallet. We’ll be running corn cobs at UMM. 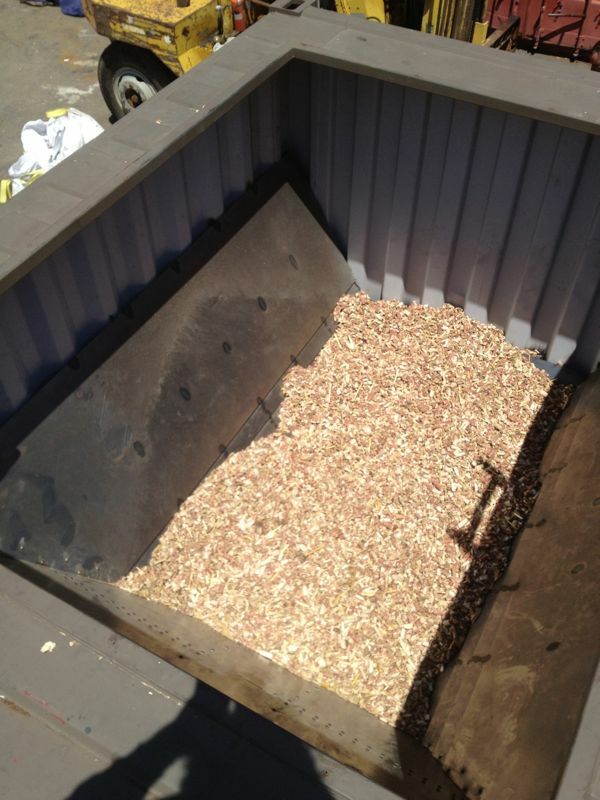 Most of the testing at APL were on wood chips. 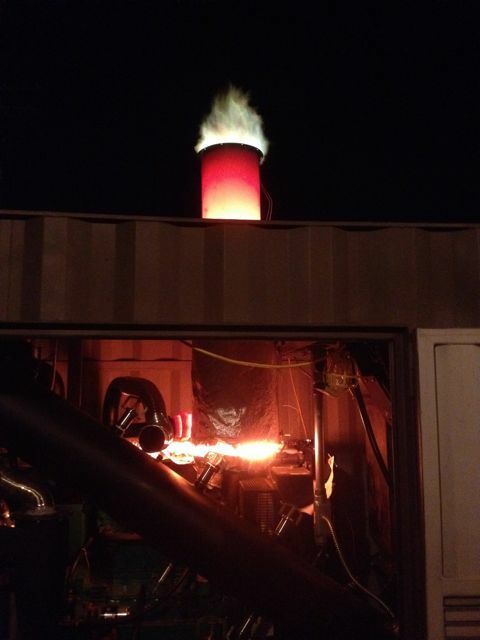 As usual, what started as a gasifier project turned into a fuel handling project. Getting a 24hr hopper integrated into the shipping container, with airlock and secondary heated auger to the gasifier, turned into a non-trivial 3D LEGO puzzle. 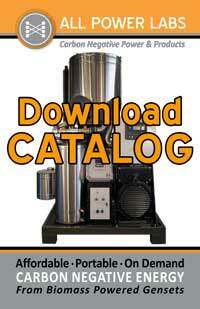 See the galleries for the details for how we finally solved it. 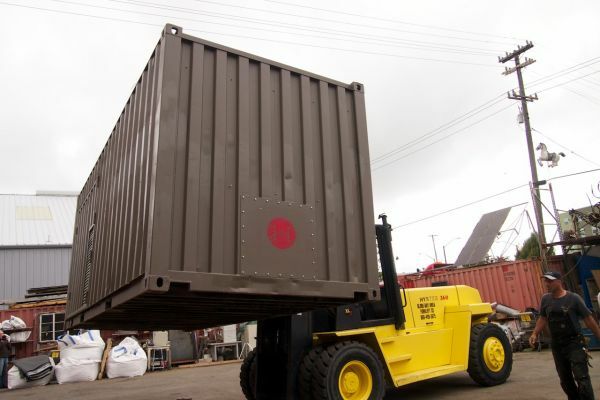 We get many people asking us when we can offer this unit to other projects. The answer is not yet. We are not yet at a point of maturity in the design and details to offer this as a regular commercial unit. We expect to be there in about one year. To help us get there, we are looking for additional projects where a still in development system is an appropriate fit. This will be a research or entrepreneurial setting that can tolerate a not-yet-fully-hands-off-24/7-running-systyem, in return for the ultimate reward of a much compacted and price optimized total solution vs other current options on the market. Write us at sales@allpowerlabs.org if you are interested. Hope to see some of you in Morris this Thursday. The GEK went to university….University of Minnesota at Morris to be exact. 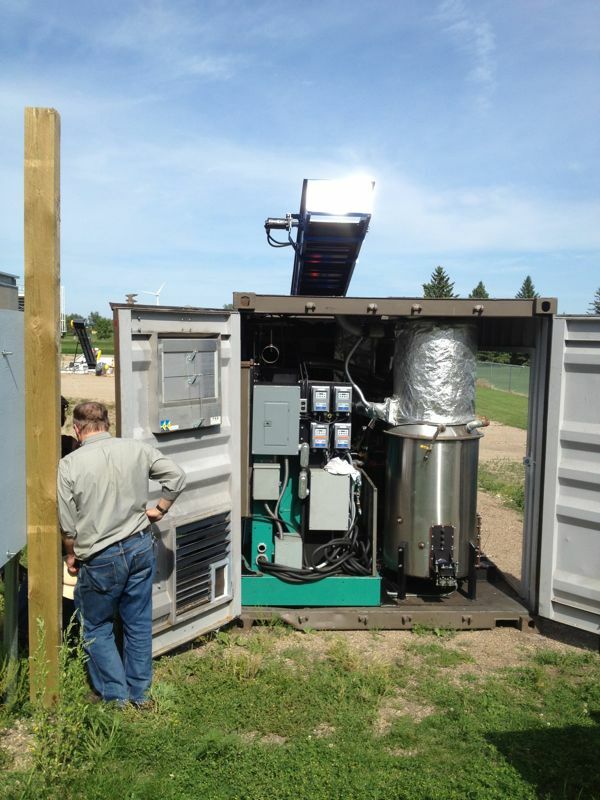 UMM was awarded a grant of $174,258 by the Renewable Energy Marketplace – Alliance for Talent Development (MNREM) initiative to develop new curriculum in biomass gasification technology. Jim Barbour at the university partnered with ALL Power Labs to use the GEK as the platform for learning in this three-week intensive course. 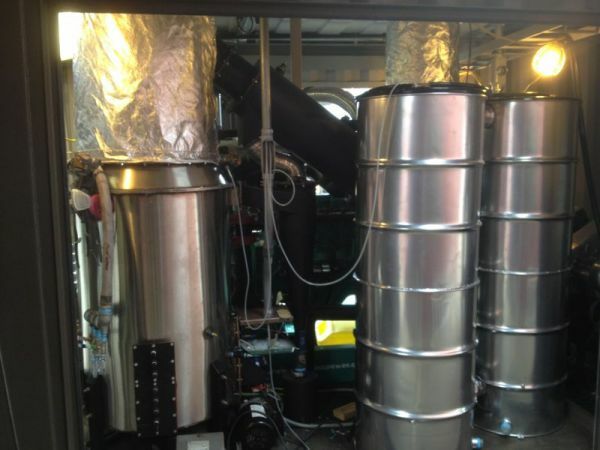 The Class, Renewable Energy with Biomass Gasification, taught principles of biomass gasification with a focus on chemical, biological and economic considerations of biomass energy production. All students benefited through a curriculum of hands-on training in chemistry and biomass with classroom and lab activities. APL’s Jim Mason went out as a guest lecturer for the last few days of class. The class had an amazing lab set up. Great data was gathered and more people were indoctrinated into the cult of the black goo. Look at their set-up. 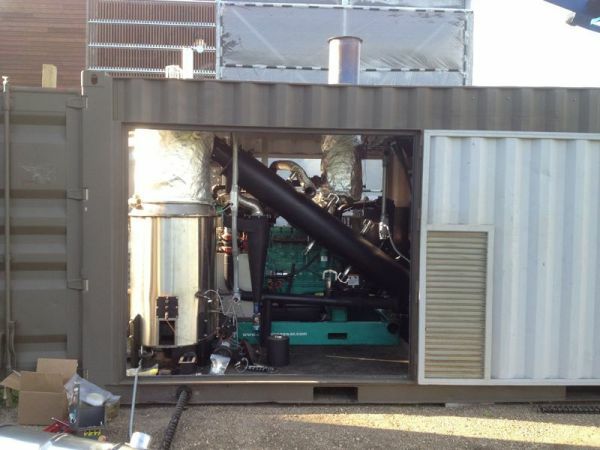 Gasification – It’s a gas!